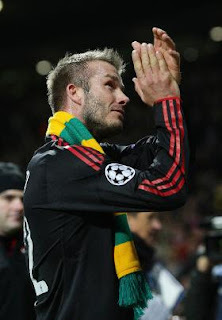 I'm sure you were watching the incredible moment last night when Beckham bathed in green and gold. It's moments like this that justify all the collective effort we've been putting into this campaign. We are showing our strength. We are making a real difference. We are fighting for the soul of our club and every one of us has a duty to stand up and be counted. Change can and will happen - we just need to fight for it. We will win if we are United. These are excerpts from an email I received the other day from the Manchester United Supporters Trust, which I joined more out of curiosity than conviction. It's yet another chapter in the United story, by which I mean soap opera. Sure, there were lots of people shouting anti-Glazer slogans on Wednesday, but every one of them had paid a hefty sum to be there. They hate the Glazers; they pay the Glazers good money to tell them so. That is not the way to break a businessman’s heart. All of which is fairly harmless until you pause to think how much economic and emotional energy is invested into this passtime (something that just passes the time), this amusement (from the Greek a-muse meaning to cease to think) while the people of Haiti weep in their tents. 'That's just how the world works,' the football fan might say. So would the Glazers.